Foodpairing has been one of my major sources for inspiration in the last few years. In contrast to my other most favorite reference – the Flavor Bible, which lists compatible ingredients based on past menues and recommendations of chefs – Foodpairing extracts pairings based on the chemical flavor components of foods and drinks. The more similar the chemical composition of two ingredients, the more likely they can be combined in a dish as well. Probably one of the most well known weird combinations based on chemical compounds is caviar with white chocolate by Heston Blumenthal. 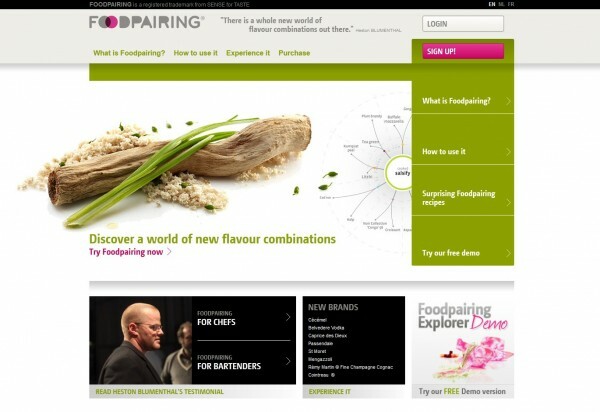 Though, now with the help of the renewed Foodpairing website the possibilities for novel flavor pairings are limitless. This entry was posted in Reviews and tagged flavor combination, flavor pairing, food combination, food pairing, foodpairing, review, website on February 21, 2012 by Robert.